Enjoy subtle earth tones mixed with light blue and sage green in the Cabin Collage Bedding. The reversible coverlet is khaki corduroy and taupe chamois. The pillow shams bring in a touch of wildlife with the collage pattern that reverse to houndstooth check. Finally the three panel bedskirt is Ranger green faux leather. Enjoy subtle earth tones mixed with light blue and sage green in the Cabin Collage Bedding. 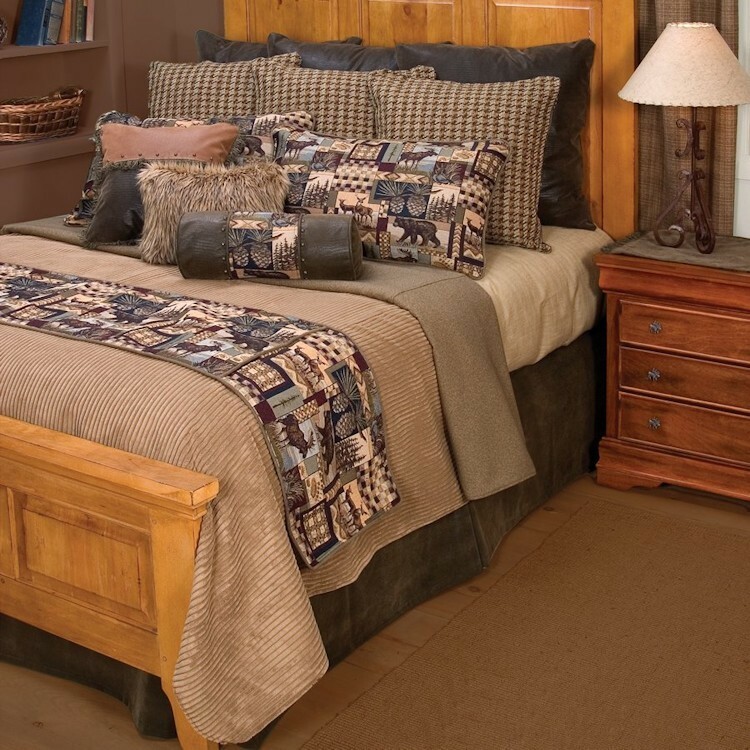 The reversible coverlet is khaki corduroy and taupe chamois. The pillow shams bring in a touch of wildlife with the collage pattern that reverse to hounds tooth check. Finally the three panel bedskirt is Ranger green faux leather. Spice up your bedding with the addition of euro shams, super euro shams, bed runner and accent pillows..